So we’ve been visiting some friends for a few days and a very lovely time was had. On the way down at the weekend, we stopped at Warhammer World so that DB, Smallish and I could play a couple of games of 40k and christen a 1,000 point Silver Skulls army. They won both of their games and I was very proud of them. Then we headed further south into familiar country (both DB and I are Southerners by birth; it’s always a relief to hear people speaking normally). Despite the fact that there had been some snow and that the roads were possibly a ‘bit iffy’, we challenged the elements and arrived at our destination in good time on Sunday night. We then proceeded to have a couple of awesome days, including a trip to London (where I got to indulge myself ridiculously in the Moomin Shop in Covent Garden). The plan yesterday was simple. 1) Leave about 11.30. Drive north on the M1, go via Nottingham for another game and the chance to have a Chat with my editor. 2) Leave WHW any time after 5 – it’s only a 2.5 hour drive home. Boring road bit coming up here. The planned route was this simple. M2, M25, M1 to Nottingham. Then, M1 and A1(M) home. Easy peasy lemon squeezy. So we’re driving along the M2 and we see the Big Scary Sign. M25 CLOSED BETWEEN JUNCTIONS 24-27. One of these is the M1 junction. The other one is the Alternative Route – the A1 junction. Both of these roads are now DENIED to us. We have two choices. Go clockwise on the M25 instead (which would add a LOT of miles to the journey) and come at the M1 from the Heathrow side. The radio tells us that there are massive queues approaching that junction whilst the rubberneckers undoubtedly Do Their Thing. The other choice was to join the M11 and go up towards the A1. A pain in the arse, definitely, but an option at least. So… we go for the second choice. We join the M25 with a view to heading onto the M11. Only as we’re driving along, we see the second Big Scary Sign. M11 CLOSED BETWEEN JUNCTIONS 7-10. Which is the direction we’re going. That red line. See how it mocks me? 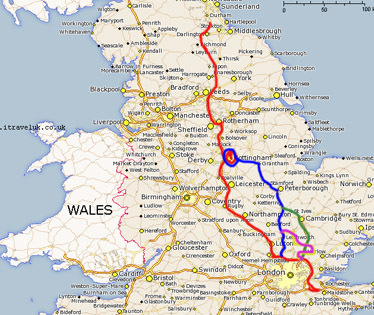 The red line was the planned route home (via Nottingham). The blue line was Plan B. The GREEN line was emergency Plan C and the purple line is what actually happened. Now, the diversion doesn’t look that bad, does it? But let me put it this way. Had we been able to get along the original planned route, we could have made Nottingham in 2 hours from the point where everything diverged. Instead it took at LEAST that long to traverse the purple route. This was largely because the traffic from the M1, A1 AND M11 was congregating along two A-roads in Hertfordshire. It took us 3 hours to travel about 70 miles. Unsurprisingly, I wrote Nottingham off as a bad idea. After spending 2 hours driving at between 5-10 miles per hour, I’d had enough. So we just came home. In hindsight, we have decided that quite simply, the South did not want to let us go. I probably should have listened.